An awesome CNC controller board for CNC machines : it's the brain in machines that make stuff. It reads commands from your computer and turns motors to move a tool that manufactures something. The Smoothie project is about creating a platform for controlling digital fabrication machines and to make that platform as useful to as many people, projects, and use cases as possible. By combining all of the jobs into a single modular firmware Smoothie allows different communities that would otherwise be working apart to share a common basis and to add their specific uses on top of it. By making one board that can run all of these different machines Smoothieboard creates a hardware platform that different projects can share and build upon. In the smoothie community progress on one aspect of the project benefits all of the different communities using the platform. While most current Open Source Hardware electronics use 8-bit AVR microcontrollers ( such as those used by Arduino ) Smoothieboard runs on a more powerful 32-bit ARM microcontroller ( LPC1769 Cortex-M3 ). This allows for smoother and faster step generation, as well as more precise math, deeper planning, and leaves room to add more features. It’s all Open Source but it’s also innovative technology to help you get the most out of your machine. Because so many individuals worldwide work together on this project lots of efforts have been put into translating the power of the 32-bit chip into features that make smoothie much easier to use than conventional firmwares. No recompilation is needed when changing any parameters: simply plug the board in over USB and you will get access to a configuration file to modify. It’s as simple as that. Updates, reconfiguration, and playing g-code files all happen over USB or even your network. And you still get your classic serial console over the same cable to send commands. The smoothie project is also about building great collaborative documentation for both users and for developers that is beginner-oriented and as exhaustive as possible. A lot more than is usual is there already on http://smoothieware.org and more is added all the time. Want to know the real reason that Smoothie is so great? The secret is the community. Smoothie is Open Source, warmly welcomes contributions, and is designed to make those contributions easy to design and implement. Over the past years hackers from all around the world have come together to help and support each other and newcomers, talk about Smoothie’s future and design, and build a competent and welcoming community. The firmware is modular: it has been designed so that if you need to add functionality it is easy, fun, and clean to do so. New code is added in the form of a new module so there is no need to go digging deep into smoothie’s internal organs. Hooks have been prepared and all you need to do is to plug into the right ones. This makes adding new functionality very fast and we feel it is the main reason why the Smoothieware code base is getting so much love. If you are doing something out of the ordinary like inventing a new cool machine, adding something awesome to an already existing machine, or if you need to test a new idea and you need it to be as painless as possible then Smoothie was made for you. In order to make sure you only pay as much as you really need for your specifc machine, Smoothie comes in several different versions, each with different component loadouts. 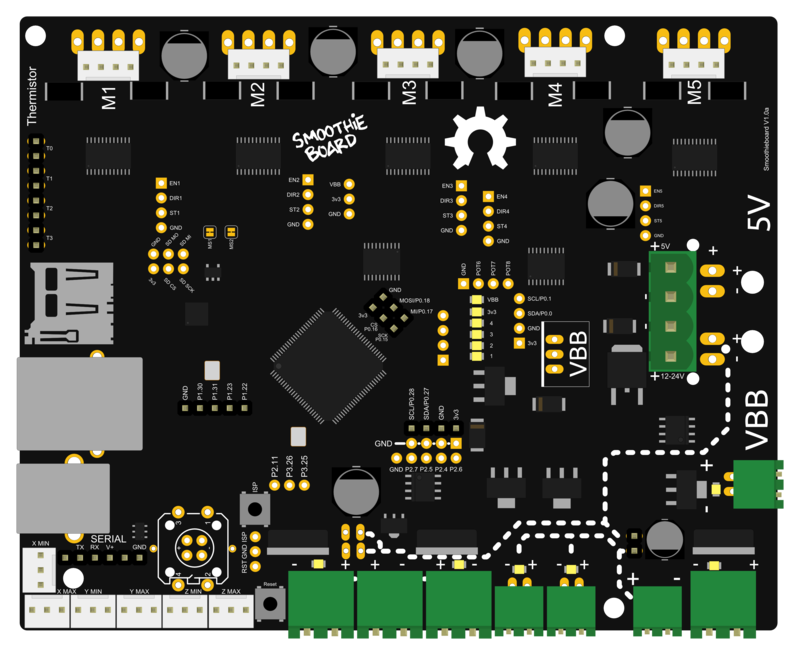 Smoothieboard v1 is the first released Smoothieboard and has received several updates. It has gone from an experimental project to a widely used and acclaimed system. The board comes in 3 versions, 3X, 4X and 5X, with different sets of peripherals each. More information on the Smoothieboard v1 page. Smoothieboard bare PCB without any components soldered. CNC controller board for laser cutters and CNC mills, [ Ethernet support ] 0 stepper motor drivers, 0 MOSFETS, no connectors provided.